She commands the world’s fifth largest healthcare organization, with close to 4 million beneficiaries and a $13.5 billion annual budget. She’s a 52-year-old nurse, wife, mother of three and three-star general, has been awarded the Bronze Star, the Legion of Merit and the Distinguished Service medal—among other honors. 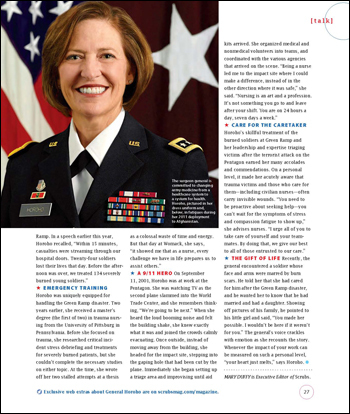 In a telephone interview for the Winter 2013 issue of Scrubs magazine, Lt. General Patricia Horoho, MSN, MS, RN, spoke about her background in nursing, the priorities she’s set and the challenges she faces as surgeon general of the U.S. Army. A NURSE IN COMMAND: When she entered the army in 1983, shortly after receiving her BSN from the University of North Carolina, Horoho says she couldn’t have imagined rising to the ranks of surgeon general because “at the time, nurses had no chance to command.” Now she is the commander of a worldwide staff of 140,000, operating in 29 executive agencies and 480 facilities. MOVING UP THE RANKS: Her rise to the top of army medicine has included experience commanding hospitals, medical systems and the Western Regional Medical Command. In 2007, she assumed command of the Walter Reed Army Medical Center (now the Walter Reed National Military Medical Center) after the media firestorm and resulting government investigations into conditions there. Horoho has worked on policy matters in the Pentagon and transformed the Army Corps of Nurses as its chief, instituting the Patient Caring Touch System based on five elements: patient advocacy, enhanced communication, capability building, evidence-based practice and management, and healthy work environments. She also fostered development of nurse leaders and nurse researchers. “The army is way ahead of the curve in how nurses are valued,” says the surgeon general. She remains committed to fostering a culture of collaboration and respect, where care is compassionate and accountability is measured by impact on the patient—not just the final outcome, but also the process. A NEW APPROACH: Moving Army Medical Command from a healthcare system to a system of health is a top priority for the surgeon general. Soldiers—and civilians—spend, on average, 100 minutes a year with a doctor, nurse or other healthcare provider; that leaves 525,500 minutes a year the surgeon general terms the “white spaces” of a person’s life. “To influence health,” says Horoho, “you must influence the white spaces.” That’s the time someone eats a double cheeseburger, smokes a cigarette or has one too many drinks. As the military and the nation battle the healthcare crisis, nurses are well-equipped to serve on the front lines. “They have the opportunity to make a difference in a variety of roles. We are very key partners in the healthcare team,” says Horoho. ONCE A NURSE, ALWAYS A NURSE: The summer before she was sworn in to become the 43rd army surgeon general, Horoho—then a major general—was deployed to Afghanistan as the leader of a team assessing frontline healthcare. In between tours of medical facilities and meetings with soldiers, she rolled up her sleeves and got to work in a trauma unit. At the end of the day, she called her husband to tell him it was the most rewarding and exciting experience she’d had in years. After returning from Afghanistan, the surgeon general had the chance to connect with one of her trauma patients at a Super Bowl party, where he was part of a contingent of wounded warriors. “The ability to connect with a patient is exactly the reason I went into the profession,” Horoho says. THE GIFT OF LIFE: Recently, the general encountered a soldier whose face and arms were marred by burn scars. He told her that she had cared for him after the Green Ramp disaster, and he wanted her to know that he had married and had a daughter. Showing off pictures of his family, he pointed to his little girl and said, “You made her possible. I wouldn’t be here if it weren’t for you.” The general’s voice crackles with emotion as she recounts the story. Whenever the impact of your work can be measured on such a personal level, “your heart just melts,” says Horoho.